With the wide variety of products on the market, it is impossible to track down all of them. However, our data team is working around the clock to get these products from a variety of brands in to the D-Tools library, so you can not have to worry about catalog management. To bridge the gap of this solution, we have enabled a import csv products feature that allows you to bring a table (CSV or Excel file) into D-Tools Cloud, and import the products. When uploading a file, it should be formatted properly. 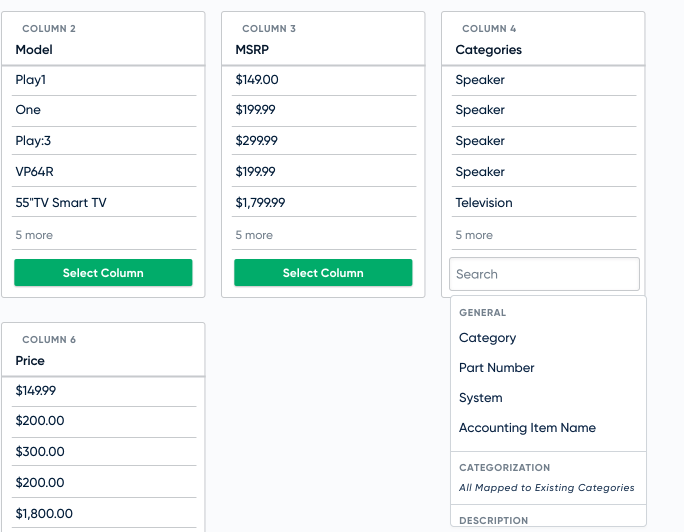 The first row should be all your column labels, and each row after is a product you would like to import. Its important to note, that the file should be a CSV or Excel file. While Excel is a paid product, most file readers can read a CSV. For more on formatting your file, use this article. Your file must include Brand and Model. If you don't have a Brand for the file, you can select one within the process. You will not be able to get past the map headers step without a brand and model identified. Map headers in the file of the fields you would like to have mapped in the file. Like stated above, you must have a mapped brand and model column for the file. This will enable D-Tools Cloud to import it and be searched upon in your product search in a quote. D-Tools Cloud will automatically map the headers of the columns it can identify. For the ones that can't be identified, you will need to help map these columns. To do so, find the column you want to match, and click the "Select Column" button. You can then search for the D-Tools field you want to match it to. Any fields unmapped, will not be imported with the product. After you have mapped the headers, D-Tools Cloud wants to do a look up on the uploaded brands. Help match them to existing brands within the D-Tools Library. This will help keep your catalog clean, and avoid duplicate products. Mapped brands will have the mapped brands next to them. You will notice some might be in blue. This means they are a suggested match, which D-Tools has automatically matched for you. You can remove the match and/or select a different match. Unmatched brands will create a new brand. We recommend you find a brand that you can match with, as this will help keep your catalog of My Products organized. Of course, we realize you may need to create new brands from time to time. Regardless of if you have a categories column in your file, D-Tools will ask you to match up categories. This is because categories are so important within D-Tools Cloud. There are labor rules, accessories, price rules, and more tied to each category. You can always leave all as uncategorized, but you will miss out on all this great functionality. Finally, you will be asked to review the file you are about to import. From here, you will see the imported product, the mapped product (if there is one), and the category. While you can just click the import button, it is recommended you take the time to check all the products and categories so you can have the cleanest catalog of products. Remember, putting the work in now, will prevent you from having to deal with it when building a quote.